HDFC twins, Infosys, HDFC, L&T, and Yes Bank were among top gainers, while ICICI Bank, NTPC, Maruti, and ONGC were the top losers in Wednesday’s trade. BSE and NSE, forex and commodity features market will remain closed on Thursday. 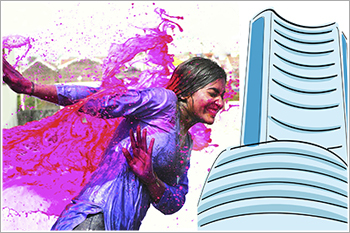 All the wholesale commodity markets, including those of metals, will stay shut on Thursday for Holi. The stock market took a breather after a seven-day up-move. HDFC twins, Infosys, HDFC, L&T, and Yes Bank were among top gainers, while ICICI Bank, NTPC, Maruti, and ONGC were the top losers in Wednesday’s trade. The Sensex ended 23 points higher at 38,387 while Nifty ended in the red after closing 11 points lower, at 11,521. On the sectoral front, BSE Oil & Gas Index's fell 2%, followed by power, metal, auto and utilities indexes slipped 1-2% respectively. On the flipside, BSE Realty Index was the top gainer. Amongst the broader market indices, both BSE Midcap and BSE Smallcap underperformed the benchmark indices and ended with losses of 0.4% and 0.3% respectively.